In 2015, Vietnam commenced criminalization of bribery of foreign public officials and bribery in the private sector as recommended in the United Nations Convention of Anti-corruption (UNCAC). Article 364.6 of the 2015 Penal Code provides that, “Any person who gives a bribe or promises to bribe a foreign official, an official of a public international organization, or an office holder in an enterprise or organization other than state organizations shall be dealt with in accordance with this Article.” Under Article 364, fines for giving bribes range from VND 20 million to VND 200 million, or a penalty of up to three years’ community sentence, or a penalty of up to 20 years of imprisonment. The internalization of UNCAC Article 16.1 and 16.2 resulted from Vietnam’s national self-assessment of UNCAC implementation in 2011 and 2012. Findings from the review suggest areas where Vietnam met UNCAC’s requirements, as well as areas that need further compliance with UNCAC’s provisions and to strengthen its own legislation and enforcement mechanisms on combating corruption. In particular, important gaps identified in the self-assessment report regarding criminalization are mostly related to non-compliance or partial compliance on issues of bribery of national public officials (art. 15.a and 15.b); bribery of foreign public officials (art. 16.1 and 16.2); trading in influence (art. 18.a); embezzlement of property in private sector (art. 22); laundering on proceeds of crime (art. 23.2.b); protection of witnesses, experts and victims (art. 32.1; 32.2.a,b; 32.3); protection of reporting persons (art. 33); cooperation with law enforcement authorities (art. 37.5), and issues of criminal records (art. 41). In addition, the self-assessment identified important areas of no-compliance, including illicit enrichment (art. 20); bribery in the private sector (art. 21a and 21b) and liability of legal entities (art 26.1). 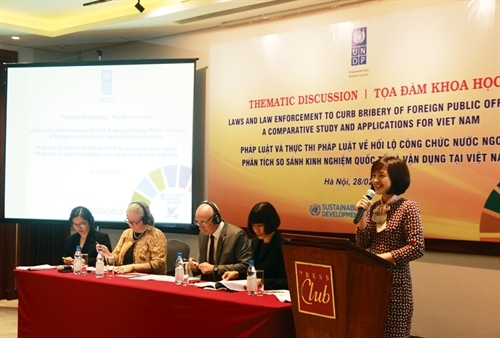 To analytically support Vietnam’s on-going efforts in putting the country’s latest legislative moves in criminalizing bribery of foreign public officials, which to a large extent will support the implementation of provisions regarding bribery in the private sector that Vietnam has adopted in its 2015 Amendment to the Penal Code, in 2017, the United Nations Development Program (UNDP) in Vietnam commissioned a research study on international experiences in application of criminalization of bribery of foreign public officials and implications for Vietnam in enforcing Article 364.6 of the Penal Code. Using a comparative approach with emphasis on institutional and legislative analysis, the policy research paper helped identify good/poor practices and lessons for Vietnam in criminalization of bribery of foreign public officials. Ultimately, the policy research paper aimed to facilitate the enforcement of the new provisions in the Penal Code from January 1, 2018, when the 2015 Amendment took effect, with its focus on Article 364.6 on bribery of foreign public officials in Vietnam as the destination country, in investment destinations overseas, or to an official of a public international organization. 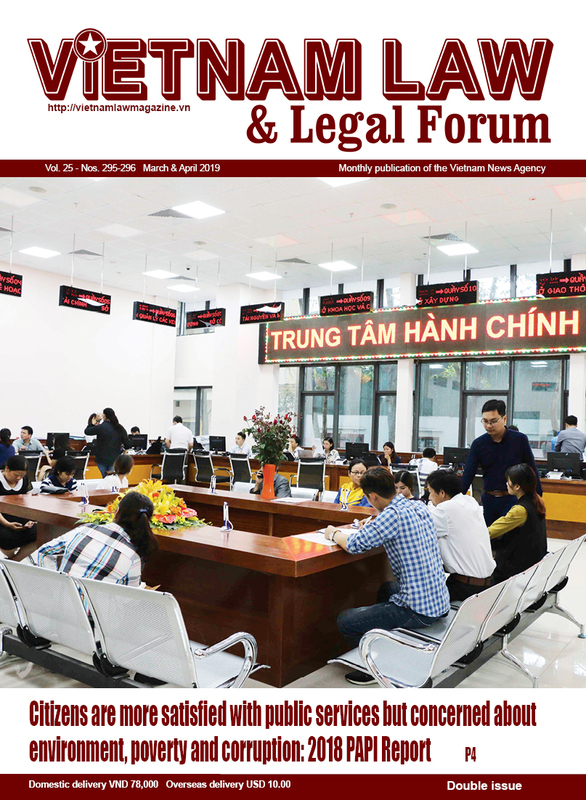 In this article, we highlight key findings from our comparative study of selected international experiences and suggest policy implications for Vietnam in regards criminalization of bribery of foreign public officials (FPOs). Vietnam has increasingly been taking part in economic integration and globalization. In such a context, there is an emerging trend of investment by domestic investors in other countries, which may create risks of bribery of foreign public officials or international organizations to obtain commercial advantages in international investments. In 2015, Vietnam criminalized bribery of FPOs and officially recognized “giving bribes to FPOs, officials of international public organizations” is a criminal act. This shows Vietnam’s concern about maintaining fair competition in business, ensuring good governance, and promoting international co-operation in fighting against corruption. The new provisions entered into force on January 1, 2018, despite a low level of knowledge as well as awareness of law practitioners and businesses on bribery of FPOs. To ensure that the new provisions are enforced, it is useful to provide recommendations and advice on mechanisms and solutions for the comprehensive and effective enforcement of the law on bribery of FPOs. It is the first time that the 2015 Penal Code imposes criminal liability on giving bribe to FPOs; therefore, it is essential to conduct a comparative study on international practices to identify solutions for effective law enforcement, including guidelines on law application and settlement of other related matters. Difficulties and challenges in law development and enforcement in terms of bribery of FPOs from other countries should be examined comprehensively for lessons learnt for Vietnam. Before offering some recommendations, we reviewed the current legal framework on bribery of FPOs of some selected countries and analyzed their law enforcement mechanisms regarding how anti-foreign bribery law works and/or does not work and why. We selected the legal systems of different countries for comparative analysis. Five country cases are selected as they have criminalized bribery of FPOs. These include the United States (“the US” with the Foreign Corrupt Practices Act (FCPA) that addresses the problem of international corruption by criminalizing bribing foreign government officials very early since 1977); the United Kingdom (“the UK”, ratifying the OECD Convention on Combating Bribery of Foreign Public Officials in International Business Transactions (OECD Convention) in 1998 and reforming its anti-corruption law by the enactment of the 2010 Bribery Act); Japan (which criminalized bribery of foreign public officials since 1998); South Korea (with the Act on Preventing Bribery of Foreign Public Officials in International Business Transactions (FBPA), taking effect on February 15, 1999); and, China (criminalizing bribery of FPOs through amending the PRC Criminal Law, which came into force on May 2011). Anti-bribery of FPOs with relevant considerations including the legal framework, elements of the offence, criminal liability of legal persons, jurisdiction of the law, the law enforcement has been analyzed and discussed from comparative perspectives with practices of the US, the UK, South Korea, Japan and China. Experiences from the five country cases with different levels of legal framework development and law enforcement on bribery of FPOs, however, show that strong institutional will to improve legal frameworks is key to combating bribery of FPOs. The cases of South Korea and Japan show efforts in improving their systems to fight bribery of FPOs, although they still have some weaknesses such as unclear definition of foreign public officials, a lack of relevant case studies focusing on bribery of FPOs, a lack of effective mechanisms for self-reporting and whistleblowing. For China, the additional provision on foreign bribery seems to be have been added merely for compliance with UNCAC. We acknowledged that criminalization of bribery of FPOs is not only an issue of criminal law but is also related to the problem of legal mechanisms to prevent and detect this offense in businesses. Therefore, to detect and handle bribery of FPOs, there is a need for comprehensive mechanisms and solutions, including international co-operation in the fight against bribery of FPOs. This study also contributes to enhancing the effectiveness of the legal framework on anti-corruption in general, and to reforming the Law on Anti-corruption in particular. The 2015 Penal Code does reflect the special feature of foreign bribery through the element of “FPOs” or “officials of international public organization”. However, it does not define the concept of FPOs. 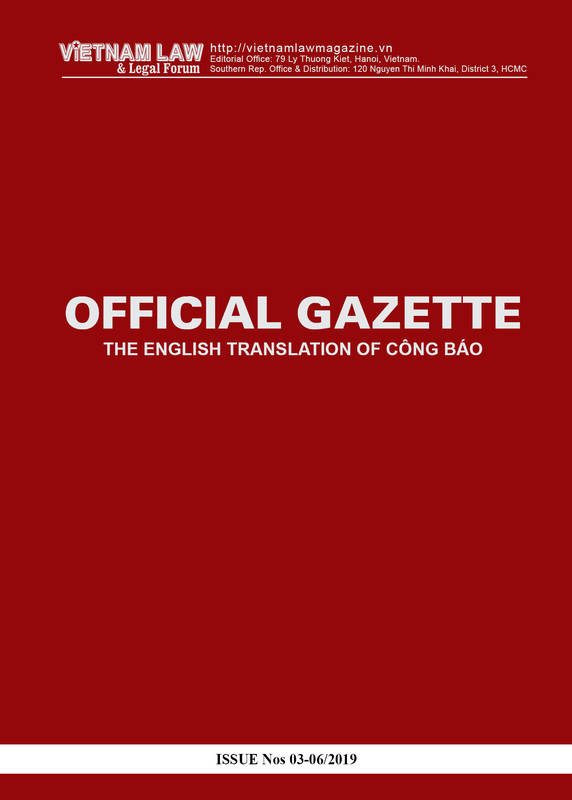 In addition, through comparative analysis as well as opinions received from interviews, it can be concluded that the way of criminalizing giving bribes to FPOs under the Penal Code of Vietnam neither reflects all UNCAC’s special features nor fully complies with requirements of it. In particular, the combination of bribery of FPOs with domestic bribery in legislation is inappropriate to correctly determine what elements constitute bribery of FPOs. Further, such a combination does not show other differences between foreign bribery and domestic bribery, including the briber (often legal persons under the laws of other countries), some requirements of the intent and purpose (the scope as well) of the offense. Regarding the mechanism of detecting bribery of FPOs, it should be noted that although the Law on Anti-corruption recognizes awarding whistleblowers, giving bribe is not classified as corruption crime as provided in the Penal Code, so whistleblowing of foreign bribery has not fallen under the scope of this law. In addition, the Law on Anti-corruption has a provision on encouraging self-detection of corrupt acts in businesses, but it is not clear enough and it excludes the act of giving bribes. Unlike the other five countries’ legislations, the Law on Anti-corruption lacks provisions on self-reporting and detecting bribery of FPOs within businesses. These are key obstacles for Vietnam in the detection of bribery of FPOs. Reviewing the current legal framework on mutual legal assistance (MLA) in criminal matters, extradition, joint investigation, transfer of criminal proceedings shows that the framework still has loopholes that may negatively affect the effectiveness of international cooperation in investigation, prosecution, adjudication and execution of judgment on bribery of FPOs. Current laws do not regulate in detail the competence and procedures for dealing with issues raised by the requests of MLA from other countries like, for example, urgent arrest of persons before receiving official requests of extradition; freezing assets or limitation of asset transfers, or seizing assets in Vietnam based on the orders of a foreign court. The Law on Mutual Legal Assistance and the treaties on MLA in criminal matters between Vietnam and other countries only mention transferring criminal proceedings but have not yet stipulated for general principles. The 2015 Criminal Procedural Code does not define this matter either. Although Vietnam has taken part in some bilateral, multilateral and regional cooperation, its actions are not adequate. Moreover, the fact that Vietnam does not directly apply international treaties, makes international cooperation even more difficult. In summary, Vietnam still lacks necessary mechanisms to enforce provisions on bribery of FPOs and officials of international public organizations under the 2015 Penal Code. The capacity of law enforcement officials in criminal cases of transnational crimes is still limited. Mechanisms for cooperation in criminal proceedings, especially international cooperation in investigation, prosecution, and adjudication of criminal cases are also unclear and difficult to implement. Based on the lessons learnt from the comparative analysis and the analysis of the shortcomings of Vietnam’s laws regarding anti-bribery of FPOs above, we put forward the following recommendations for further consideration in legal development and enforcement in the country. It is strongly advised that the Anti-corruption Law include new provisions on business integrity and hold businesses accountable for developing and implementing codes of conduct and internal control mechanisms. The experiences of the US, the UK, South Korea and Japan indicate that the prosecution of bribery of FPOs should not be the first and sole solution. Mechanisms for early prevention and detection are essential. These countries criminalize bribery of FPOs not only to punish it but also to promote the use of preventive and self-detection mechanisms by businesses to avoid criminal liability. Requiring businesses to establish their codes of conduct and internal control mechanisms will be a starting point for imposing criminal liability of commercial organs for bribery of FPOs in the future. As discussed in this paper, the Law on Anti-corruption still contains loopholes in the scope of corrupt acts. Excluding ‘giving bribes to FPOs’ from the list of corrupt acts in the law prevents the detection and handling of such acts. In order to ensure the consistency of the legal framework on anti-bribery, the law should be revised by expanding the scope of acts under its jurisdiction to giving bribes, including bribery of FPOs. By introducing provisions on prevention and detection of giving bribes to FPOs into the law, the basis to fight corruption will be improved. • The scope of benefits or areas of transactions for which bribery of FPOs is committed: Should it include all kinds of benefits and advantages that the briber wants to gain through the performance of FPOs’ duties, or only advantages obtained through international commercial transactions? It is essential to establish bribery of FPOs as a separate crime under the Penal Code. With a thorough analysis on the interests harmed by the crime, the international feature of the bribee, the purpose and area of business deals or advantages that the briber wants to gain, there are clear differences in the elements and the levels of seriousness between bribery of FPOs and that of domestic officials. It is therefore crucial to set up a separate crime of bribery of FPOs, clarify the elements of the crime and differentiate the severity of criminal penalties. Reforming the 2015 Penal Code should include definitions of FPOs and officials of international public organizations to ensure the consistent understandings of such concepts to facilitate and enable investigation, prosecution and adjudication of criminal cases. Legal definitions of these concepts need to include the fundamental elements defined by Article 2 of the UNCAC. In addition, the definition of FPOs should be more specific to include, for example, officials of state-owned enterprises as defined under the UK or Republic of Korea’s laws. Furthermore, in the context where Vietnam has criminalized giving and taking bribes in the private sector and giving bribes to FPOs, it is essential to consider imposing criminal liability on legal entities for the crime of giving bribes to FPOs. The study observes that defining criminal liability of legal persons for active bribery is common in international practices, because many countries see the need of preventing businesses from corrupt practices and punishing them for damaging fair competition and business integrity. In addition, corrupt practices by enterprises are now pervasive. A study on business integrity conducted in 2016 by the Government Inspectorate and other business surveys conducted by the Vietnam Chamber of Commerce and Industry have pointed out that giving bribes is often conducted through businesses’ representatives for obtaining commercial advantages. Defining criminal liability for individuals is neither fair nor sufficient in cases where bribery is committed with the agreement by and on behalf of the legal entities, especially in the context where some legal entities are established to commit organized crimes. • It is essential to revise the Law on Mutual Legal Assistance by clearly defining its scope in the relationship with the Criminal Procedural Code. The revision of the law needs to be done in the way that it ensures coherence while avoiding overlaps with the Criminal Procedural Code. • It is important to provide competence and procedures for dealing with requests of MLA from other countries and to fill the gaps in the legislation on extradition and transfer of criminal cases as presented and analyzed in this report. • It is also recommended that Vietnam facilitate negotiations for and expand MLA in criminal matters, extradition, and transfer of sentenced persons by signing MLA treaties with more countries, especially where there are high risks of bribery of FPOs by Vietnamese businesses. Increased bilateral cooperation in the judicial sector will also help avoid the transfer of assets gained through corruption crimes. • It is necessary to introduce provisions on bribery of FPOs to training materials when disseminating the 2015 Penal Code. • Providing traning courses on bribery of FPOs for law enforcement officials is essential. • “Issuers” who are essentially publicly-traded companies - any corporation (domestic or foreign) that has registered a class of securities with the Securities and Exchange Commission (“SEC”) (Section 12, Exchange Act) or is required to file periodic or other reports with the SEC (Section 15(d), Exchange Act). • “Domestic concerns other than issuers” are any US citizen, national or resident, as well as any corporation, partnership, association, joint-stock company, business trust, unincorporated organization, or sole proprietorship that is organized under the laws of the US or its states, territories, possessions, or commonwealths or that has its principle place of business in the US. • “Persons other than issuers or domestic concerns” are any foreign persons or foreign non-issuer entities that, either directly or through an agent, engaged in any act in furtherance of a corrupt payment while in the territory of the US. Officers, directors, employees, agents, or stockholders acting on behelf of such persons or entities may also be subject to the FCPA. Dr. Dao Le Thu and Dr. Phan Thi Lan Huong, law lecturers from the Hanoi Law School; and Ms. Do Thanh Huyen, Policy Analyst at the United Nations Development Program. Government Inspectorate (2011). National Self-Assessment Report on UNCAC Implementation. Draft Report. Hanoi, July 2011. See United Nations Development Program (2018). Laws and Law Enforcement on Bribery of Foreign Public Officials: A Comparative Study of International Practices and Application for Vietnam. A policy research paper on anti-corruption conducted by Dao Le Thu and Phan Thi Lan Huong and commissioned by the United Nations Development Program (UNDP). Hanoi, Vietnam: February 2018. 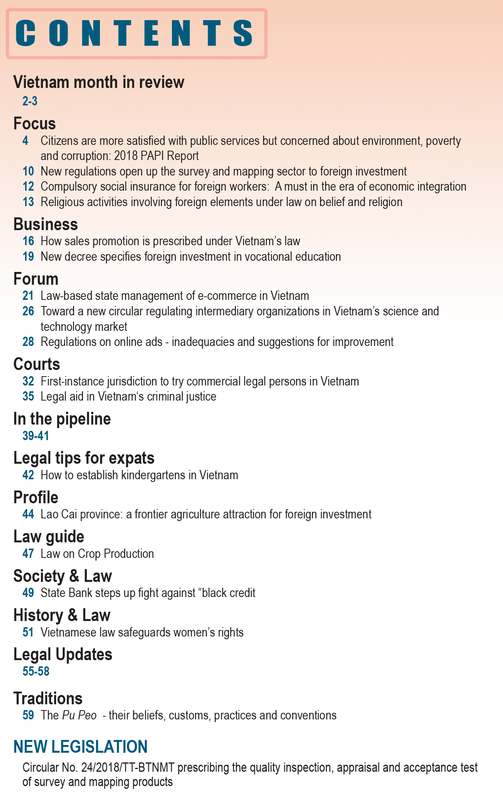 See Dao Le Thu, To Van Hoa, Vu Cuong (2016), Anti-Corruption in Business Sector in Vietnam: Legal Framework, International Experiences and Recommendations for improvement of the Draft Anti-Coruption Law, the Report was conducted under the Project: “Technical support for Vietnamese Government in reviewing and improving legal framework on anti corruption in business in order to reform the business environment and promote transparency and sustainability”, the Government Inspectorate of Vietnam and the Embassy of the UK to Vietnam, Hanoi.